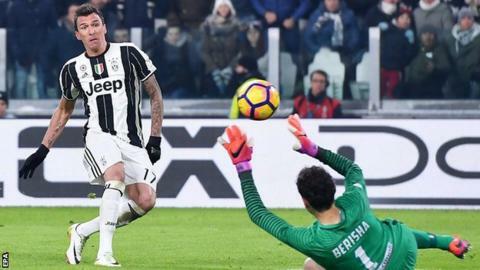 Holders Juventus rested striker Gonzalo Higuain and were almost made to pay as a late penalty from Miralem Pjanic helped them squeeze past Atalanta and into the Italian Cup quarter-finals. Atalanta ensured a nervy finish when 18-year-old Emmanuel Latte Lath made it 3-2 but Juve held on. Juventus boss Massimiliano Allegri said: "I won't accept us taking our foot off the gas. "This seems to happen to us a lot now, at least once a month." Juve were comfortable in a first half that saw Paulo Dybala beat Etrit Berisha with a superb first-time strike and then Mario Mandzukic sweep home a second, before Abdoulay Konko narrowed the gap. Juventus, who have won the Italian Cup for the past two years, will play Milan or Torino in the last eight.